Consequently, split skirts were designed to overcome this difficulty. Unfortunately, they met with stern resistance from gentlemen who viewed them as too similar to trousers. One man told his sister he wouldn’t be seen riding through a canyon with her dressed in one. Of course, pants were out-of-the-question. Only outlaws and ladies of the evening wore those. Introducing the riding habit. 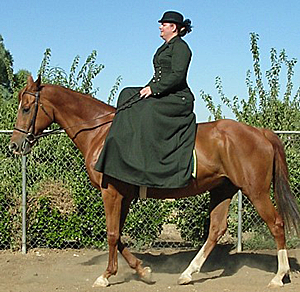 It created an even hemline while in the saddle with extra fabric for draping over the knee, and it fastened with a button and loop to allow the wearer to walk without tripping. These were worn with pants underneath, just to make sure nothing unseemly could be seen. The real drawback to both the split skirt and the riding habit was the danger. Danger? Yes. It seems the loose fabric would occasionally become wrapped around some portion of the saddle. If for whatever reason, the horse spooked the unfortunate lady could be dragged to her death. If riding habits are so dangerous, why are they becoming popular again? 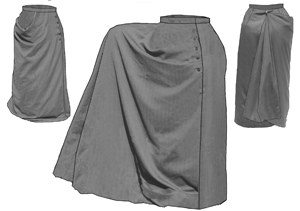 Well, designers have created an “apron” skirt. It mimics the riding habit, but it’s safer. This entry was posted in Historical Tidbits.